As summer was just beginning, I mentioned that I was switching things up, speeding things up, and setting my sights on the mile. Last weekend, the boys, some good friends and I raced the mile. It was a great success and a lot of fun! So pull up a chair and read all about the journey from training to one of my favorite races: the Capitol Mile in beautiful Madison, Wisconsin. 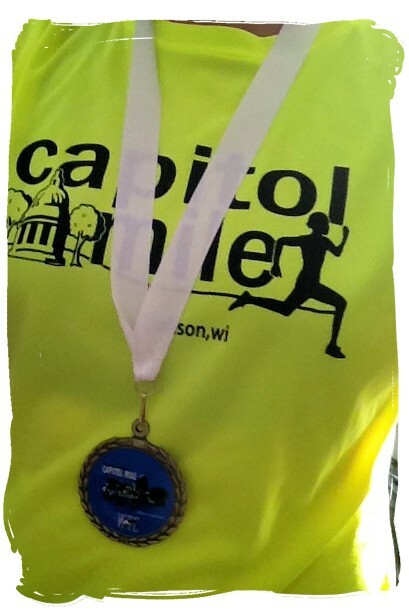 Every year my boys and I train with Fleet Feet Madison’s Miler in Training program. We meet on the track to workout one night per week for six weeks. Unfortunately, it was brutally hot this summer. Due to cancellations and an unexpected trip to urgent care, we were only able to participate in 2 of the 6 planned group workouts. That’s right. TWO. But never fear because we were not going to allow setbacks to be obstacles and we managed to get all of our training workouts in – including the additional once per week “homework” workouts our coaches sent us. A little determination, team work and sidewalk chalk went a long way for us this season. It ended up being a fun, short training season with lots of quality – even if it was not quite according to the plan. A bonus to group training? Supah fast coaches to guide you through training. My goal is always sub-6 (“A” Goal), but I have only landed that once (in 2007). According to all of the race calculators I looked at, I should be between 6:04 and 6:08 based on my marathon times. So I decided that I’d shoot for sub-6, but would realistically be super happy with anything under 6:10 (“B” Goal). Like any race, the weather is an important factor. Because the mile is so short, it isn’t really a potential deal breaker like it can be for the marathon. However, I was certainly watching it closely this year given how hot this summer has been in Wisconsin. During the days prior to the race, the forecast was ridiculous. Weatherunderground was calling for temps in the upper 90s and a heat index of 111! (For what it is worth, when I read it was going to be that hot, I suggested to my friend and training partner that we should perhaps indulge in boat drinks at our favorite Jamaican joint rather than race). Lucky for us, the weather cooperated and stayed in the upper 80s / low 90s. So the race was on and our boat drinks were held off until another day. Second Quarter: The second quarter continues downhill, sharp turn, flattens out, another sharp turn then we start climbing the hill. My goal was to really focus and hit my 1:30. Third Quarter: The third quarter is the hardest as it is finishing the hill, turning, running a flat stretch, another turn back onto the nice little downhill. I knew I’d lose some time on the hill and my coach advised me to just accept that. So my goal was to hang on to pace as closely as I could and return to goal pass as soon as I could. My coach had advised me to focus on accelerating at the top through the curve to help get back onto pace. This race is hard because it doesn’t start until late afternoon. It is nice to be able to sleep in, but it is hard to wait anxiously all day for the race (not to mention timing meals, etc.). By go-time I was a bundle of nervous energy! The race directors ended up combining the fast men’s and women’s heats at the last minute. All of the men lining up were planning to run sub-5 and the women were seeded at sub-6:15. BUT, there were only 5 women. One of the women I recognized because she runs the race (and wins it) every year. She is a sub-5 miler and participated in the 2000 Olympics in the 5k and 10k for the Irish team. She mentioned that she was aiming for a 4:40. 4:40! I knew my good friend Michelle who (finally!) trained with us this season would be a lot faster than me too. So pre-race, I was well aware that there was a healthy chance I would end up coming in dead last in my heat. I wasn’t a big fan of those odds, but I was ready to do this thing. Shortly after lining up, the gun went off. Right away 3 women were ahead of me and the 4th was tucked in right behind me. I looked at my watch at the first turn and I was at a 5:20 pace. SLOW DOWN MINDI. When I did, the woman behind me promptly passed me. But she then slowed down rather significantly and I passed her just before the quarter. My Garmin clicked off 1:27. Perfect. I held on through the second quarter and mentally focused on staying on pace. I also tried to accelerate through each curve as planned. It really seemed to help to be focused on little things like that and to have a set strategy. As I started going up the hill, I saw my husband and the boys and gave them big high 5s. 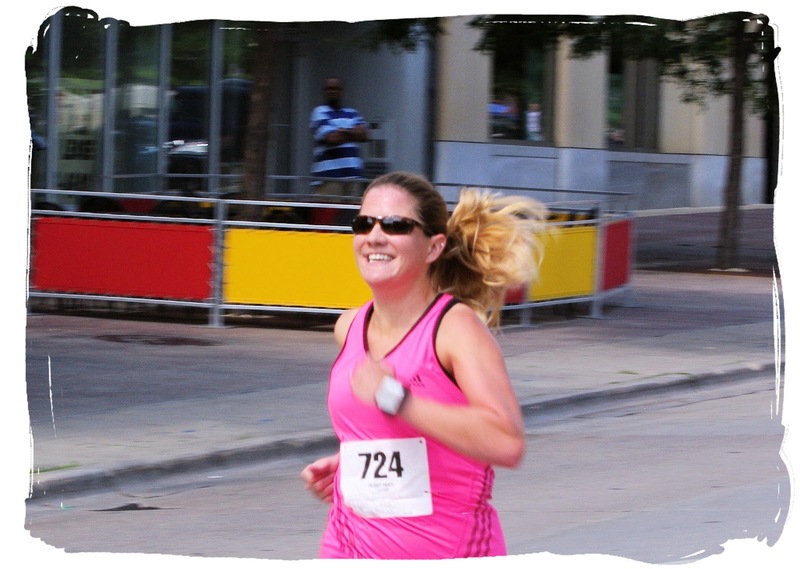 My coach also yelled out my time at the half (2:58) and told me I was on track – GO! My Garmin clicked off a 1:29. Sweet. Then it started to hurt as I knew it would. As I reached the top of the hill, I focused on accelerating through the corner and getting my pace back where it should be. Frankly, at that point I no longer paid attention to my Garmin when it beeped off the quarter splits, but I later learned my third quarter was 1:39 (oops). From that point it was downhill, turn and a straightaway into the finishing chute. I was hurting, but was very motivated by the fact that I knew there was still a woman behind me. I did not hear her, but I did not want to be passed!! Down the home stretch, I was giving it everything I had, but my legs felt like jello (my coach later asked me about it – apparently I looked like they felt like jello, too). I ended up finishing in 6:09. (Garmin said last quarter was 1:27), but it measured the course short by 5 seconds. Good stuff. The mile is a hard race, but I can’t wait to do it again next year! Click here to read Mint’s full race report to see how Mint’s young boys and fast friends did!! Then tell us, have you ever raced a mile or trained for a race with a training group on the track? If not, we urge you to try it! It is fun to run hard with others and to get great advice from coaches. Next O-H-I-O: Let the Akron and Columbus Marathons Knock Your Compression Socks Off This Fall! Nice job training well and executing the strategy, I’d love to get in a mile someday, but would prefer to do it on the track so as not to have any influence from hills. That sounds like a hard course! I wonder what you’d do on a track. Definitely really close to sub 6 if not for sure! Thanks for sharing and racing a road mile is definitely on my to-do list after you made it sound so fun!